When the Camesina String Quartet formed in 2007, one of its mutual concerns was to once again dare a little more purism. 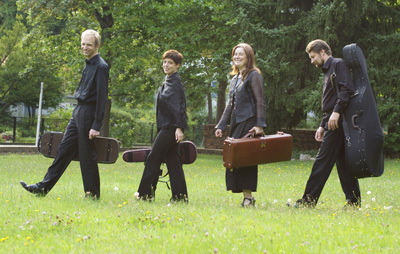 While other similar ensembles have long returned to modern playing techniques and accessories, and while the label "historical performance practice" is mostly limited to the use of gut strings, the Camesina String Quartet tries to approach historical sound, not only through the study and application of sources, but also through a constant questioning and pioneering spirit, never succumbing to a mere imitation of currently prevailing taste. Since its foundation the Camesina Quartet has been a regular guest at the Haydn Festival Lukavice/Pilsen, and many other concert venues in Germany and Europe, amongst others it appeared in the Early Music series in the Berlin Musical Instruments Museum and the Wildt'sche Haus in Basel/Switzerland. The World Premiere Recording of the three string quartets by J. L. Dussek has been welcomed by the press as a landmark rediscovery. It has been broadcast numerous times by radio stations Europewide and has been reviewed enthusiastically throughout. The name Camesina Quartet refers to the Camesina House where W. A. Mozart resided from 1784 until 1787 and where he played the six string quartets dedicated to Joseph Haydn for the first time in the presence of his elder friend. It was in this apartment where the famous quartet parties took place with Joseph Haydn (first violin), Carl Ditters von Dittersdorf (second violin), Wolfgang Amadeus Mozart (viola) and Jan Vanhal (violoncello) playing string quartets together. The house is named after the stucco plasterer Alberto Camesina, who owned the house for a time, and who decorated it with a Baroque stucco ceiling. It was under this ceiling that Mozart probably composed some of his greatest music, including the six string quartets dedicated to Joseph Haydn.